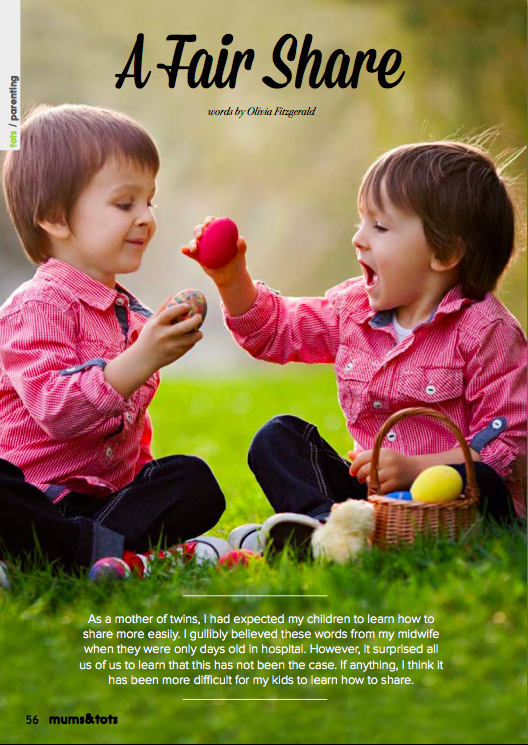 As a mother of twins, I had expected my children to learn how to share more easily than singletons. I gullibly believed these words from my midwife when they were only days old in hospital and in the end I was surprised to find that this has not been the case. If anything, I think it has been more difficult for my kids to learn how to share. To this day, and they are now five years old, we have struggled with sharing and trying to make everything equal. No matter how we try, every day has its challenges; they manage to find that toy that the other secretly covets, teasing each other in the process. Since they were babies, we began doing what every parent instinctively does to encourage their children to share. ‘Give me share’ I’d say and they’d gladly squash a morsel into my mouth. They were generous with me and their father, but when it came to each other, everything and anything ‘is mine!’ They loathed to share and were unbelievably territorial when it came to their bedrooms and especially their new toys. Sometimes, I think we expect children to learn how to share too quickly and from our experience, I think it takes years for them do so willingly. On a few occasions during the toddler years, they have been given a single gift for their birthday present or for Christmas. They’ve looked up after unwrapping the present with an incredulous expression as if to say ‘so you seriously expect us to share this?’ I think it’s unfair to expect anyone to share one birthday present, let alone a toddler or pre-schooler as the notion of sharing is still beyond their comprehension. At this stage they had just grasped playing alongside each other. For a long time, we bought our kids two of almost everything, hoping to make things fair and avoid trouble, but this was very costly and sometimes we’d buy toys they didn’t take notice of. Also as we boy and girl twins, they didn’t always want the same gifts. We decided to buy them different toys and that way they’d have a broader selection. It turns out that they both generally still prefer the same toys – the arts and crafts toys, torches, gadgets and Lego. We noticed that if they understood the toy was a ‘shared’ toy from the outset, there weren’t as many rows. Introducing shared toys got the ball rolling and we saw a marked improvement in their attitude to sharing. Just before their 5th birthday party I gave them a little pep talk to prepare them for the possibility that many of the 20 children coming to their party (yes, utter madness, I know), would be in their playroom and, I stipulated, they may borrow their toys for a time during the party. At first this went down like a lead balloon, but then we agreed that if they wanted to have a party and invite all the classmates over that they needed to share some of their toys. For a while, they thought their toys would go missing and they took some convincing. They had trouble believing that their toys wouldn’t be damaged or go missing. We reached a compromise and put some of their special and most cherished toys away before their guests arrived. I sensed their initial discomfort as they watched their classmates bustling around their playroom, rummaging and inspecting the toy boxes, but after a short while they began to relax. They were reintroduced to some toys they’d forgotten or never played with. They enjoyed being the authority on the workings of their toys, how to get the best out of them and what pieces belonged where. We feel we’ve watched our kids make a mini breakthrough recently in sharing and trusting other children to look after their toys, but like all children they still have their moments. Unfortunately there is no magic wand or instant fix, but rather constant reaffirming that it’s nice to share and that there are benefits to sharing. Children will begin to share as they are encouraged to do so, but they will only share willingly when they have developed a sense of empathy, which apparently only really happens at around the age of 6. Young children are establishing their sense of self away from their mother. Up until this point they see themselves as one with their mother and now they see their toys as extensions of themselves and this is why they are so unwilling to share. Around the age of two or three, you may see your child become less willing to share their belongings or others’ belongings as they may believe everything belongs to them and this is a perfectly normal part of their development. Some children may share their belongings willingly, but if like me, you feel like your children need a little extra support there are some simple ways of helping them. A great place to begin is by asking them to show their belongings or a new toy to another child and perhaps let them touch it for a moment without passing it over and then progress to letting the other person handle the toy for a moment before passing it back. Elder siblings can helpfully demonstrate sharing by letting their younger children play with their toys also. Practice the mantra with your children ‘when you’re finished, can I have it next please?’ and of course always lead by example. Demonstrate generosity to your children by letting them see and touch your prized possessions, although I do suggest hiding the Chanel perfume! Undoubtedly one of the best ways to help your child learn to share is to engage in activities which promote cooperation and turn-taking. Ideal activities are cooking and baking e.g. make simple buns and take turns to stir the wooden spoon or shake sprinkles onto the buns. This will help them develop trust and learn that they will receive an item back after showing it to you. All arts and crafts activities provide a great opportunity to share and work together. Sit down side by side for a cutting and sticking session and get into the habit of asking them politely to pass the glue or glitter when they’ve finished with it and soon they’ll begin to mimic you. Invite other children over to play for play dates and vice versa. My children, at the age of 3 had a hard time sharing their toys when we had their friends over, but after a few visits back and forth to each other’s houses they realised there were benefits and they could play with their friends’ toys, and let’s admit they love nothing more than exploring a new playroom and its treasures. Another inventive way to demonstrate sharing to your children is a simple puppet show between two puppets where they share an item by asking politely, taking turns and waiting patiently until the other has finished with it. As our children are a little older and have begun to appreciate the idea of sharing and the rewards, I now realise that it always helps to focus on the positives and remind them how lucky they are to have so many toys to play with. If they are grateful for the toys that they have, they may find it easier to share their belongings with others. Originally published in Mums & Tots Spring issue 2015. It’s fascinating really. I wonder why do you think sharing is a more foreign concept than owning? Is it instinct or learned? I think all kids go through it. They discover their own free will all of a sudden and try to use it to the max to see what they can do. Maybe I’m making excuses, but I think it’s harder for twins or the first-born singleton as they haven’t got older siblings to model behaviour. I think it’s instinctive to want power and control, but then young children are constantly told ‘don’t touch’ when they’re out and about, so perhaps that drives it too. Of course, I’m not a psychologist, so that’s just my penny’s worth. I enjoy checking in with you.